The technology behind nickel-zinc (NiZn) batteries has been available for ages, however making it cost effective and affordable for end users is something that has happened in the last few years. So a few years ago the first consumer oriented rechargeable NiZn batteries in popular sizes such as AA and AAA started appearing on the market and though there was initial interest in them now, a few years later, we can say that they did not come to stay. The main idea behind NiZn cells is that they are able to provide higher operating voltage than the rechargeable NiMH batteries, a voltage closer to the one of the Alkaline batteries, but with the ability to recharge them. Nickel–zinc batteries have a nominal voltage of 1.6V or a bit higher than the 1.5V of an Alkaline battery and their open circuit voltage usually is about 1.8V, but can go as high as 1.9V, so while these should do well in devices designed for Alkaline batteries you should be careful when using in a device that does not have a proper voltage regulation as there is a chance that a NiZn battery can damage it, though most devices should be Ok. If here is no power regulator in a device it will use the higher voltage that NiZn provides, so for example a flashlight may be brighter or a remote control car can run faster than with NiMH or Alkaline batteries. The problem is that this can lead to the reduced life of the light bulb of the flashlight as well as overheating the motor in an RC car and thus damaging it, so again you should be careful with the higher voltage of NiZn batteries. Also note that the more the number of batteries being used in a device, the higher the chances are that you might have trouble because of the higher voltage that NiZn batteries use. With one or two normally there should not be problems, but going for four or even eight batteries in a device the increase in the total voltage over what Alkaline or NiMH batteries will provide can be quite high and a cause a problem in some devices. According to manufacturers of NiZn batteries they are supposed to offer similar number of recharge cycles as normal NiMH batteries, though you should get a special charger for them as they need to get to 1.9V in order to be fully charged and thus are incompatible with most NiMH chargers that stop a lower voltages for NiMH batteries. So generally the cost of just a few NiZn batteries is not going to be justified when you add the cost of the special charger you need to get along with the batteries, however if using more batteries than the things will balance out. Another important advantage of the NiZn rechargeable batteries is the fact that they are designed to be recharged faster with a constant current equal to their capacity (C) or half of their capacity (C/2) as opposed to NiMH cells where you normally have to use lower current to charge them. Also NiZn batteries have a lower self discharge rate as compared to NiMH, so even if you store them fully charged and ready to be used they will probably last longer than standard NiMH batteries, but not that much as they have a discharge rate of about 10% per month which can be a few times lower than that of NiMH batteries. On the other hand the newer Low Self-Dicharge NiMH batteries are with a significantly lower self discharge rate and NiZn batteries do not yet have an LSD version. 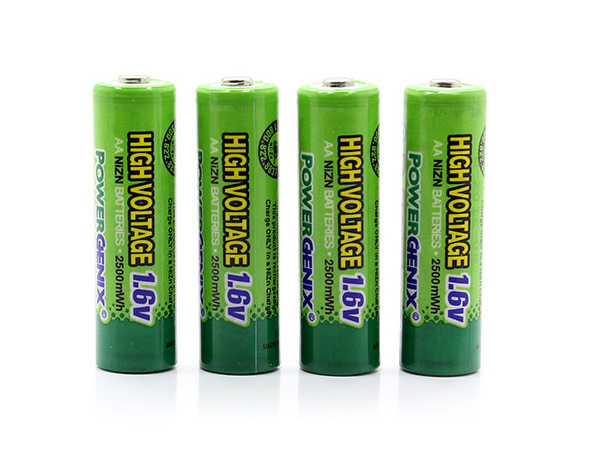 If you take a look at the photo above showing a pack of four 1.6V AA NiZn rechargeable batteries from Powergenix you will probably notice that their rating is a bit different than what we are used in seeing for NiMH batteries. Instead of mAh rating for the capacity of NiMH batteries here we have a mWh rating for the NiZn (not all NiZn batteries are rated this way, some use mAh ratings) and there is a reason for that as using mWh rating simply shows that these batteries can provide more power with lower mAh capacity than what NiMH batteries can do with the same mAh rating because of the higher voltage of the NiZn. In fact 2500 mWh capacity for the NiZn translates to about 1500 mAh capacity, but for a NiMH battery to be able to provide 2100 mWh power it needs to have about 2100 mAh capacity. So directly comparing these two types of rechargeable batteries with their mAh capacity ratings may not be the best idea, and by the way the same thing applies for direct comparison between the mAh capacity of Alkaline and NiMH batteries again because of the difference in their voltage, so comparing the mWh rating of one type of battery to the mWh rating of another type of battery is the better thing to do and it is not hard as long as we know the true mAh capacity and the nominal voltage of a battery. Have in mind though that even if comparing mWh ratings of different batteries there are also other factors that need to be taken into account as well, so while it might be better to be used instead of mAh ratings it is still not be that accurate for comparison. Another important thing to note regarding the NiZn rechargeable batteries that is related to their higher voltage is that when using these in a device that has an indicator of the remaining charge of a battery the indication may not be accurate. Because of the higher voltage the NiZn batteries may be reported as full or almost full while at the same time you might be actually close to having them almost fully discharged especially if the device you are using them in is designed for Alkaline batteries. Anyway, in general we suggest that you do not bother with NiZn rechargeable batteries at all as a the moment these are being sold mostly under various Chinese no-name brands, so the risk of having trouble with the reliability of the batteries or the charger for them is higher. With that said however we do plan to test and publish the results from some NiZn batteries that we manage to secure in order for you to be able to compare them better with other types of batteries or with other brands of NiZn if you are still interested in that technology even though it did not manage to get very popular and these are probably going to be phased out gradually until the next time somebody decides to revive NiZn again.